As we head towards the Labour Day weekend, I would like to take this opportunity to wish all the best to each and every one of the millions of students heading off to school. or already there. These are the times of your lives. Enjoy everything about the experience. Get involved in your school. Attend events and rallies. Volunteer your time and skills to worthwhile causes. Say 'Hi' to somebody new everyday. But most of all - study your brains out and get what you paid all that money for - a fantastic education which will set you up for an amazing career. Keep your eyes on the prize! Cheers! Final Financial Prep For the Coming School Year! The countdown is on. Depending on where you live on this great planet you could either be at school already, settling in to your living space - or you may just be getting the finishing touches done on things at home before heading off to college next week. Either way - now is definitely the time to put those last minute preparations in place financially for the coming academic year. First things first - do you have a bank, or credit union account, either right at your school or as close as possible to where you are going to live? Dealing with your 'home' bank can save a lot of time, energy and money throughout the year. If something goes wrong with a money transfer - either into or out of your account - you can deal with it right away. Taking money directly out of the branch, or your 'home' ATM will save you extra service fees - double fees most likely since you won't be getting the convenience charge from the other institution or the fee from your own bank for using someone else's machine. Having a close-by branch will also come in handy if you need to access your 'Emergency Fund' at any point in the year. You do have an Emergency Fund - right? If you've ever read this blog before - I know you do! Are all of your accounts set up for internet banking? Although most financial institutions are completely on board the technological revolution - believe it or not, some still don't offer online access to accounts, transfers of funds or bill paying. If your bank is one of the rare ones still in the dark ages - find another bank! Being able to check your accounts with a couple of clicks can give you great peace of mind. Parents - it is essential you have the ability to transfer money into your student's account - should the need arise. Make sure you have linked to their account if you are with the same bank - or make sure you have everything you need if they are with a different bank (branch number, transit number and exact account number). With any luck - your student is going to be so financially responsible, you won't need to send them money - they'll be paying you back some money at the end of the school year!!! Keep hope alive! Does your student financial office have your proper information? Have you changed banks - or even account types since filling out your scholarship and financial aid forms? Make sure you get the proper account information into the hands - or email account - of the people who are going to be giving you money to keep going to school. The idea of going away to school is to enjoy life on your own - take in all the experiences you can at your school - and, of course, get a fantastic education. Being set up to handle your finances in the easiest way possible will allow you to enjoy everything about your new situation - without 'sweating the money'. I would like to wish the millions of new college and university students all the best for the coming year. Live it - Love it - and Learn It All!! 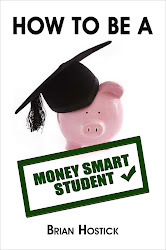 (and stay a Money Smart Student to the end) Cheers! !